I ran into an unknown GUID while using Shellbags Explorer (SBE) recently. Here's what I did to confirm what it was -- with some testing and new findings along the way. All of this was done on Windows 10. Thanks to Eric Zimmerman and Joachim Metz for quick response times and details. An unmapped GUID in SBE. You have an unknown GUID. You have an idea of what it is, but want to confirm. I had an inkling that this GUID was related to Adobe Creative Cloud. 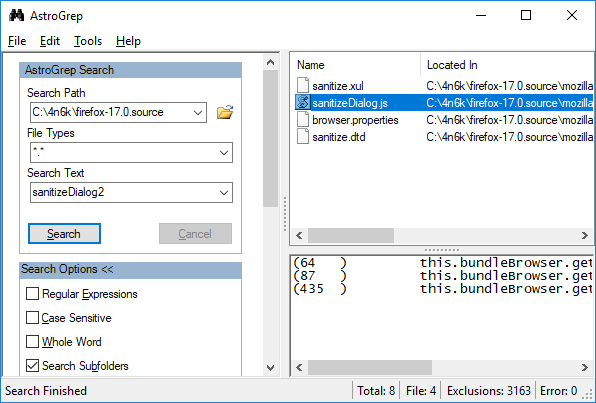 Usually, you'll be able to see some folders under the unknown GUID within SBE that are specific enough to pinpoint the application responsible -- doubly so if you're analyzing your own machine and can recognize the folders. With Creative Cloud in mind, let's confirm. First, boot up a testing virtual machine and install the Adobe Creative Cloud Desktop application. 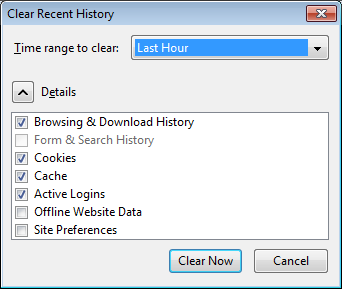 The free Microsoft VMs for IE/Edge testing are useful for this. Installing and updating the Adobe Creative Cloud desktop application. 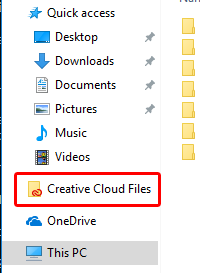 Upon installation of the application and sign-in, we can see that a new library called "Creative Cloud Files" shows up in the Windows Explorer sidebar (the default location of the folder is in the root of the user's profile). Observing new "Creative Cloud Files" library added to Explorer sidebar. Before interacting with this folder, let's do a sanity check baseline on what our UsrClass.dat looks like in SBE. At this point, we shouldn't see any shellbags entries for this location. Recursive view of shellbags entries within SBE. No "Creative Cloud Files" entries. As expected, there are no entries for the "Creative Cloud Files" location. But before we move on any further, let's grab the timestamps (standard information) for the directory. This will be important later. FTK Imager Lite showing MACE times for the "Creative Cloud Files" folder. Now that we've noted those timestamps, let's interact with the folder. Interacting with the "Creative Cloud Files" folder via Windows Explorer. There should now be a shellbags entry for this folder in the user's UsrClass.dat. Pull that, along with its .LOG files (if necessary), and open it up with SBE. 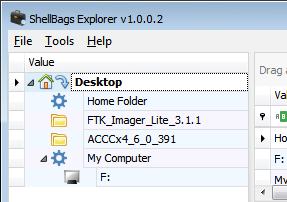 Observing the shellbags entry for the "Creative Cloud Files" folder with SBE. Looks like we got what we came for...but we're not done just yet. After running this same test on another Windows 10 machine, I noticed something strange: the last section of the GUID wasn't the same. Typically, these GUIDs will stay consistent from system to system, since most of the ones you'll come across during shellbags analysis are built-in Known Folder GUIDs. But it turns out that software vendors can extend this set of known folders by registering their own  . While the final section of the GUID seems to be different on each machine, the first sections (0e270daa-1be6-48f2-ac49) seem to have remained consistent since at least 2015 (Google it). With that out of the way, let's dig deeper into the actual makeup of the unmapped GUID entry, out of curiosity. 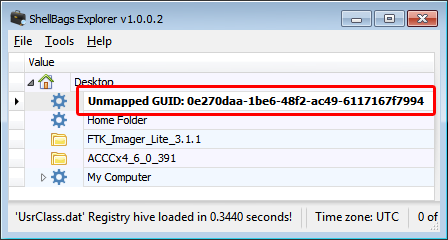 I happened to notice that the unmapped GUID entry looked very similar to the existing "Dropbox" entry on another test machine (for which the GUID was mapped). As I compared the two, I noticed that there were three Windows FILETIME timestamps in both of them. I couldn't find any explanation for these, so I referenced Eric Zimmerman's "Plumbing the Depths: ShellBags" presentation and Joachim Metz's Windows Shell Item format specification. 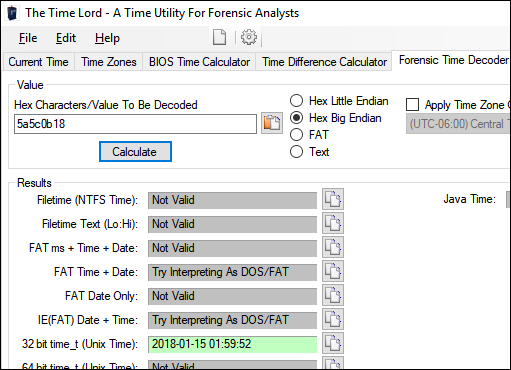 Using SBE's data interpreter to identify three FILETIME timestamps. Eric's and Joachim's documentation were invaluable for walking through the hex. They serve as perfect foundations for digging into the file formats. Still, I wasn't able to determine why I was seeing three timestamps instead of the two that were showing in the "Details" tab. And I wasn't seeing a 0xbeef0026 extension block in the specification or any reference to it when the class type indicator for the entry is 0x1f (a root folder shell item). With this information in hand, it was time to start piecing it all together. 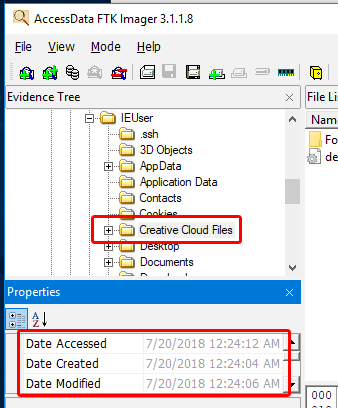 If we take a look at the above animation, as well as the timestamps of the "Creative Cloud Files" folder that we pulled with FTK Imager earlier, you'll notice that the FILETIME timestamps in the shellbags entry match up exactly with the SI MACE times of the "Creative Cloud Files" folder at the time we interacted with it. The bottom line is that, by performing behavioral analysis and walking through the file format at the hex level, we were not only able to find what the unknown GUID maps back to, but we were also able to (a) identify a set of SI MACE FILETIMEs for an undocumented extension block (0xbeef0026) and (b) determine that software-vendor-generated/registered GUIDs may not be consistent all the time (at least the last section, in this example). The larger question is: are the inconsistent GUIDs we see specific to Creative Cloud or are there more instances of this inconsistency? Every "Creative Cloud Files" GUID I have seen -- from three different machines tested -- show a different end-section of the GUID. Dropbox seems to have consistent GUIDs across machines. Could Creative Cloud be generating the end-section of the "Creative Cloud Files" GUID based on something inconsistent like username? And just like that, we have another hypothesis that we can test. Using the same VM from before, I created a new user and gave it the same name as a user on one of my other test machines. After signing in using the Creative Cloud desktop application, the new "Creative Cloud Files" folder was created for my new user account. 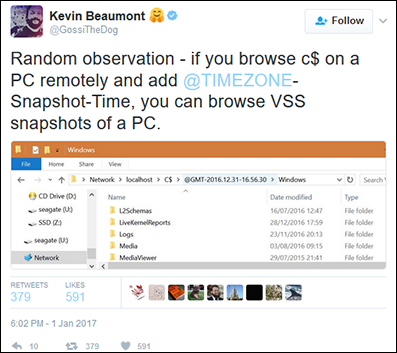 Following the same steps as above, the shellbags entry was created for it, and it was observed that the GUIDs (including the last section) for the "Creative Cloud Files" location on two different machines, using the same username, were the same! If you were to create a user named "IEUser" on your machine, and run through this whole process, you'll find that the GUID for "Creative Cloud Files" will be 0e270daa-1be6-48f2-ac49-6117167f7994. Likewise, for the "4n6k" user, you'll find the GUID to be 0e270daa-1be6-48f2-ac49-fc258b405d45. Also, this is case insensitive, so user "4N6K" will result in the same GUID. With that said, it may be necessary to match the "Creative Cloud Files" location (and any other application GUIDs that exhibit the same behavior) to the first few sections of the GUID (0e270daa-1be6-48f2-ac49-) instead of the whole thing. I saw this tweet from @JPoForenso recently. I didn't know what this was either, so I began testing. And as always, remember that it's one thing to know that an artifact exists; it's another to know how to find, understand, and make use of it. This is more of a methodology post related to problem solving, but having the logic behind the approach is typically pretty useful. So, from start to finish, let's delve into how you'd go about answering the question Jonathon posted. You want to determine what a specific part of the debugfs `stat` command refers to (but this process can be applied to any other Linux command!). 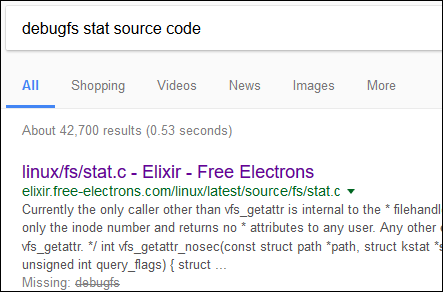 Googling "debugfs stat source code"
The first result is what seems to be the stat.c source file, related to the standard `stat` Linux command. It's not exactly what I want, but it's close enough for now. As we open the link, we can see a bunch of Linux kernel versions on the left sidebar. I didn't know what kernel version I was running on my Ubuntu virtual machine, so I ran a `uname -or` via command line to find out. Looks like I'm running kernel version 4.10.0-42-generic. Since I'm going to be running my tests on this Ubuntu VM (I already had a clean snapshot), I'd like to make sure I'm reading the stat.c source code for the closest kernel version I can get. And since we have the luxury of picking the version of the source code using this first Google search result, I'm going to go ahead and select version 4.10 from the left sidebar on the page (direct link here). 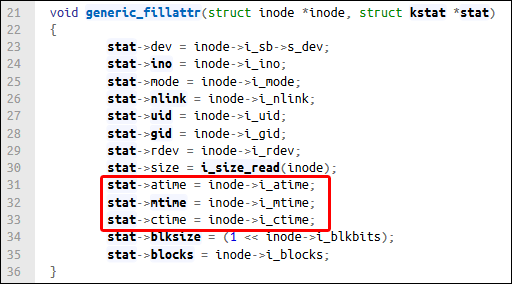 Looking at the source code, I can already see that it has a lot of the same strings that we see in Jonathon's screenshots (and just by using the `stat` command in the past) -- namely, I can see references to atime (access time), mtime (modify time), and ctime (change time). As I Ctrl+F for "ctime" within this source file, I noticed something at line 389: the added "nsec." As I looked back at Jonathon's screenshots showing the output of both the debugfs's `stat` command and the standard `stat` command, I noticed that the standard command was showing the timestamps with nanosecond granularity. The theory at this point was that the characters after the hex bytes and the colon were probably the encoded nanoseconds value. To confirm this, I ran some tests. I needed to further ensure that my setup was the same as Jonathon's; I needed to make sure my Ubuntu VM was using an ext4 file system. First, I ran `sudo fdisk -l` to list the disks and partitions present on my VM. `fdisk -l` output showing /dev/sda1 as the boot partition and that it is of type 0x83. "Various filesystem types like xiafs, ext2, ext3, reiserfs, etc. all use ID 83. Some systems mistakenly assume that 83 must mean ext2." Therefore, this is not enough information and we will need to learn something new. With some quick Googling, we can see that the `df -T` command will get us the information that we need to confirm we're running an ext4 file system. Now that we know our setup more or less matches the original, let's run a quick and dirty test to get a feel for what Jonathon was doing. First, I'm going to do a quick `ls -la` in my home directory to see what existing file I can use to run a standard `stat` against. I found a file called ".xsession-errors". We'll use that. I then run the standard `stat`. Now, let's run the debugfs `stat` command on the same file and see what we get. Note that, to use the debugfs `stat` command, you need to first specify the file system you want to use with the -w option. Since we already ran an `fdisk -l` before, we already know that we need to specify /dev/sda1. 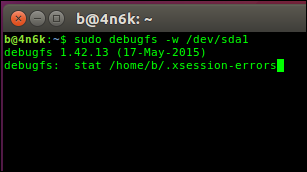 So we run `sudo debugfs -w /dev/sda1`, we will then get a debugfs prompt where we will run our `stat` command: `stat /home/b/.xsession-errors`. Also note that you can run the `stat` command against an inode or the full path of a file (as I did here) within the specified file system. (An off-topic tidbit here is that we see a "crtime," which is the "born/creation time" of the file being queried; ext file systems prior to ext4 did not support this). Jonathon already identified the first section of hex bytes (before the colon) to be the Unix epoch representation of each timestamp. Let's confirm using TimeLord. 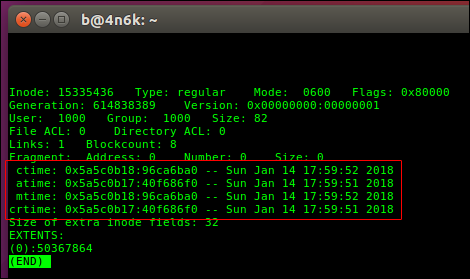 As we can see, Jonathon is correct; the first section of the debugfs `stat` timestamp is the Unix time timestamp (remember, my Ubuntu VM is set to Pacific time (-8), so you must apply the offset to get it to match). But what about the second portion? That's the real question! Knowing what we know already, we have some really good reasons to believe that the second portion of the debugfs timestamp is the nanoseconds value: we saw references to possible nanoseconds in the source code, we confirmed nanosecond granularity in the standard `stat` command, and the modify and changed times are the same using both `stat` commands. But how do we confirm this? Well...let's try Googling it. With our testing, we were able to search more effectively for what we needed. And this time, it really paid off -- there's already an answer for us! In fact, the answer goes one step further and even links us to one of Hal Pomeranz's "Understanding EXT4" articles that walks us through the ext4 timestamp format in-depth. I would highly recommend reading the full series, but to answer our initial question, we do not need to look further than the "Fractional Seconds" portion of Hal's post. "The hex value of the create time "extra" is 0x148AF06C, or 344649836. But the low-order two bits are not used for counting nanoseconds. We need to throw those bits away and shift everything right by two bits- this is equivalent to dividing by 4. So our actual nanosecond value is 344649836 / 4 = 86162459." 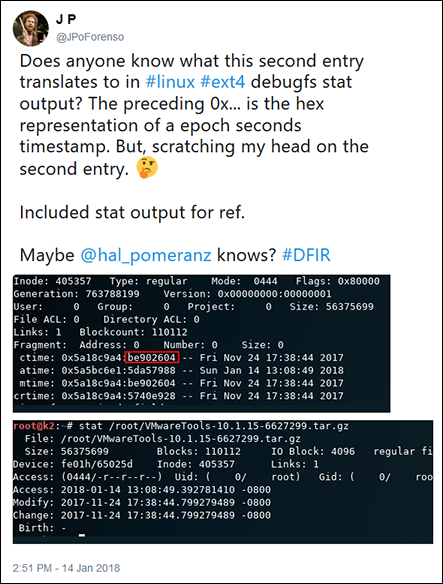 Hal explains that the second part of the debugfs `stat` timestamps (after the colon) need to be divided by 4 after being converted to decimal. So let's try that with our example. 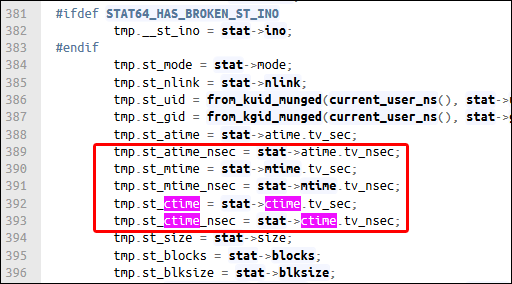 The values for each stat command are replicated below (we'll only use the access and modify times since there are only 2 unique timestamps among the four total timestamps for the .xsession-errors file). We convert hex to decimal, then divide by 4, and we get the nanoseconds value! With that, we've answered the question and learned a thing or two. Again, this was more of an exercise in problem solving and verification, but knowing how to go about solving a problem is something that you can apply to any question you may have. 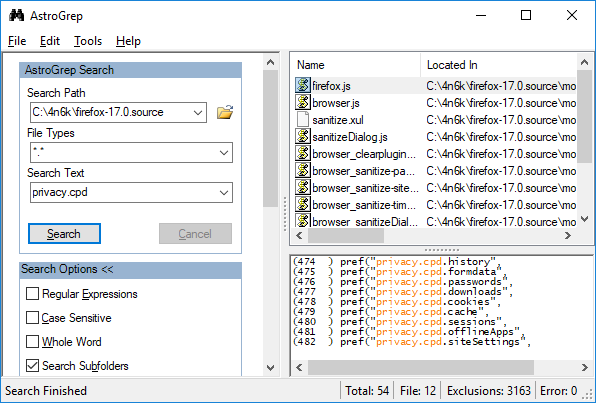 With that, we now have a better idea of how one of the many facets of Firefox operates. There is much, much more there (especially in prefs.js), but testing specific functionality in depth goes a long way in understanding how things work. [UPDATE #01 02/02/2017]: It looks like there's a command line utility to determine what the @GMT path is for previous versions of files/folders called volrest. Worth looking into if you want to find the proper path to use more easily than using vssadmin. Here's another post about it. Essentially, it's about being able to access and copy files out of Volume Shadow Copies (VSCs) from live systems remotely. There seems to be some confusion related to how this is done. Specifically, I noted a few instances    of folks not being able to get it to work. Below, I show how this can and does work. I tested all of this using a Windows 7 VM. You want to copy files directly from a Volume Shadow Copy on a live, remote machine. First, figure out when the Volume Shadow Copies were created on the machine in question. A simple way to do this is to run vssadmin list shadows as admin. Let's do this on our localhost to make it simpler; just be aware that there are many other ways to remotely run vssadmin. Output of "vssadmin list shadows." Note the creation timestamps for each VSC. We have three VSCs: one created on 8/4/2014 07:51:34 PM, one created on 9/19/2016 5:01:19 PM, and one created on 1/31/2017 11:34:16 PM. Let's copy a file from the 9/19/2016 VSC using the proper path syntax -- with specific emphasis on SMB's "previous version token" pathname extension. Output of commands showing a successful copy operation of one file from a localhost VSC (127.0.0.1). As we can see, the copy succeeded. The Test-Path Cmdlet is initially run in our PowerShell session to show that readme.txt does not exist at the path specified. Once we run our copy operation using the Copy-Item Cmdlet, we can see that this same Test-Path check returns True, indicating that the file now exists. But let's not stop there. Instead of copying just one file, let's copy a whole directory from the VSC. Output of commands showing a successful copy operation of a directory from a localhost VSC (127.0.0.1). This copy also succeeded. We can see the contents of the copied SysInternals directory in the destination folder via Get-ChildItem's recursive output. This is all fine and good, but up to this point, we've just been copying items from our local machine's VSCs. Now that we know that the above process works locally, we should be able to apply it to remote machines fairly easily. So let's do that. Output of commands showing successful connection to remote host and copy operation of one file from Sept VSC (192.168.1.199). As we can see, a simple connection is made to the remote host using net use (w/ elevated creds), and the readme.txt file from the remote host's September 2016 VSC is copied using the SMB "previous version token" pathname extension. 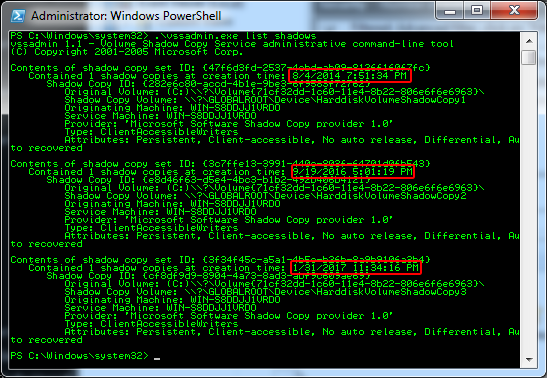 Output of unelevated volrest.exe showing @GMT VSC path names on localhost C$ for a specified location, recursively.. Sample of files/folders that were not returned when running volrest.exe across system32 as a standard user. The command run was .\volrest.exe \\127.0.0.1\C$\Windows\system32 /s. Running as a standard user returned 257 files + 26 dirs; running as admin returned 323 files + 49 dirs. At the end of the day, this technique does work. 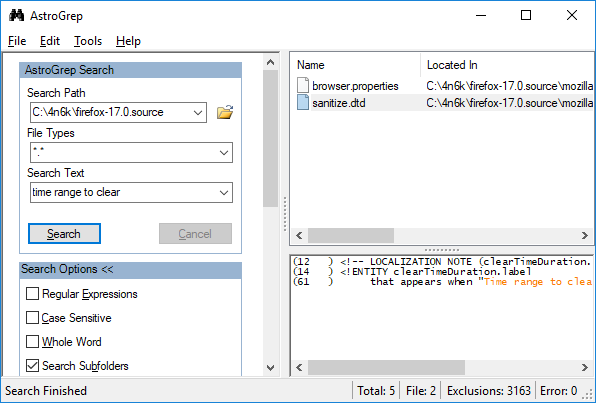 Can it be used to more easily pull VSC contents for use in forensic investigations? Sure. Could it also be used to exfiltrate data that may otherwise not look to be immediately available on a given machine? Oh yes. This is a double-edged sword if I've ever seen one. I was chatting with Jared Atkinson and James Habben about PowerShell today and a question emerged from the discussion: is there way to determine the version of PowerShell installed on a given machine without using the $PSVersionTable PowerShell command? We all agreed that it would be nice to have an offline source for finding this information. You want to determine the version of PowerShell installed on a machine, but don't have a means by which to run the $PSVersionTable PowerShell command (e.g. you are working off of a forensic image -- not a live machine). Right off the bat, Jared suggested that there had to be something in the registry related to this information and subsequently pointed us to the following registry key: HKLM\SOFTWARE\Microsoft\PowerShell. James noted that he found a subkey named "1" inside. Within the "1" subkey is yet another subkey named PowerShellEngine. As we can see in the screenshot below, there is a value named PowerShellVersion that will tell us the version of PowerShell installed on the machine. We wondered what this could mean. It wasn't until Jared noted that having the "1" subkey would indicate the existence of PowerShell v1 or v2 and that having the "3" subkey would indicate PowerShell v3-5 that this all started to make more sense. James's machine was a Windows XP workstation. My machines were Windows 10 workstations. Therefore, James's SOFTWARE hive only had a single "1" subkey. It only had PowerShell v2 on it. But why did the Windows 10 workstations have both a "1" subkey and a "3" subkey? Jared, once again, suggested that a previous version of Windows being upgraded to Windows 10 may have been the reason. Sure enough, I had upgraded my Windows 7 machines to Windows 10 and had NOT done a fresh Windows 10 install. Note that this may not be the reason for seeing both subkeys; I reviewed a machine with a fresh Windows 10 install and observed that it also had both subkeys. The bottom line is that, yes, the version of PowerShell can be found in the registry and not just by running the $PSVersionTable PowerShell command. But keep in mind that you might find more than one registry key containing PowerShell version information. Do not be fooled by the default location of PowerShell.exe. The executable's path will show %SystemRoot%\system32\WindowsPowerShell\v1.0\powershell.exe. 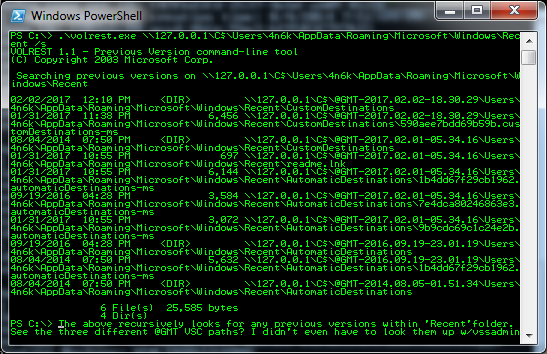 Unless manually changed, this path will show "v1.0" regardless of the PowerShell versions installed on the machine. Great! We solved our problem. But what about some of this other stuff we see in the PowerShellEngine subkey? What's that RuntimeVersion value and why doesn't it match the PowerShellVersion value? If two PowerShell engines exist on the Windows 10 machines, how do I use the older, v2 engine instead of the v5 engine? To answer these questions, let's first use the easiest way possible to determine the version of PowerShell installed on a machine: the $PSVersionTable PowerShell command. (I ran everything below on the Windows 10 machine). The version of the common language runtime (CLR). The build number of the current version. The Windows PowerShell version number. The version number of the WS-Management stack. Versions of Windows PowerShell that are compatible with the current version. The version of the serialization method. The version of the Windows PowerShell remote management protocol. And there you have it. Full explanations of what we're looking at here. Notice that when we run the $PSVersionTable command, we see a line named CLRVersion. The value associated with this name is the same as the value that we see when we look in the registry at the RuntimeVersion value. This is because both of these entries are related to the "Common Language Runtime (CLR)" used in the .NET Framework. You can read more about that here. Since I'm using Windows 10, I have .NET 4.6, which uses CLR version 4.0.30319.42000. "When you start Windows PowerShell, the newest version starts by default. To start Windows PowerShell with the Windows PowerShell 2.0 Engine, use the Version parameter of PowerShell.exe. 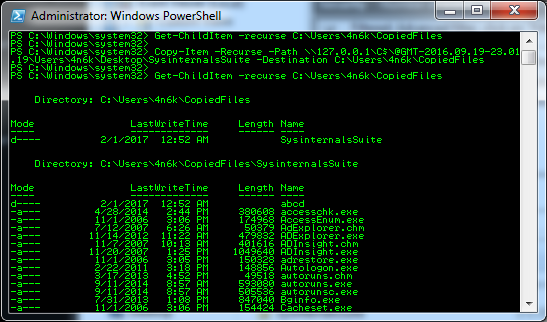 You can run the command at any command prompt, including Windows PowerShell and Cmd.exe. As you can see, our PowerShell session is now using the v2 engine instead of v5. 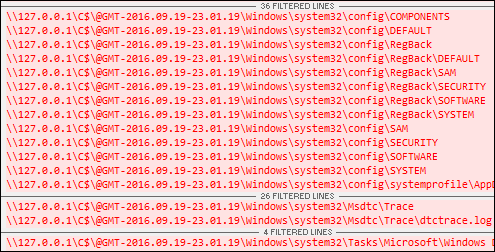 Note that when I tried PowerShell.exe -Version 3, the output I received was the same output I received for v5. This may be due to jumping from PowerShell v2 on Windows 7 to PowerShell v5 on Windows 10. This could also be because of the split between v1/v2 and v3/v4/v5 (thanks to James and Jared for this possible explanation). A big thanks goes out to Jared Atkinson and James Habben. This post wouldn't exist without their involvement and discussion.